PASADENA — Award-winning chef Akira Hirose will celebrate the 15th anniversary of his restaurant, Maison Akira in Pasadena, throughout October with a series of special menus and events. He has elaborated on Maison Akira’s exquisite and exciting menu featuring French cuisine with a Japanese flair, a mix of his culinary background and his native country. Through Sunday, Oct. 27, Hirose has created a special 15th Anniversary Kaiseki Tasting Menu. There are two options: six courses for $50 ($75 with sake and wine pairing) and a nine-course menu for $70 ($100 with sake and wine pairing). The restaurant’s regular a la carte menu will also continue to be available during this time. Hirose was born and raised in Kyoto. After high school, he moved to France, where he met a French family who owned a hotel and restaurant in Azay Le Rideau, a small town in the Loire Valley. This is where he began his culinary apprenticeship and learned about the farm-to-table cuisine. He continued his training at Maxim’s de Paris and went on to study the fine art of pastries at Ecole de Lenotre. He has also studied under world renowned Chef Joel Robuchon. After working in France for eight years, Hirose came to Los Angeles and joined the kitchen staff of L’Orangerie Restaurant. After two years he moved back to Japan to open his own restaurant, Azay Le Rideau, which became one of the top 50 French restaurants in all of Japan. 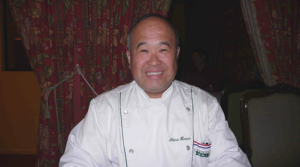 Returning to Los Angeles, he worked at Citrus, Georgian Room at the former Ritz Carlton in Pasadena, Belvedere Restaurant in the Peninsula Hotel, Beverly Hills, and was the executive chef at Tower Restaurant, Los Angeles, where he created a special menu for the emperor and empress of Japan during their visit in 1994. In September of 1998 he opened Maison Akira. Hirose was named Chef of the Year in 1998 by the Southern California French Chefs Association, and received the Fu Rei Ai Award in 2008 from Little Tokyo Service Center, KCET and Union Bank’s Asian Pacific American Heritage “Local Hero” Award in May 2009, and most recently the Pacific Pioneer Award from the Japanese American Cultural and Community Center. For many years, Hirose has supported many community events, including the annual Beastly Ball fundraiser for the Los Angeles Zoo, the annual Sake Event for the Little Tokyo Service Center, the Food & Wine fundraiser for Huntington Memorial Hospital in Pasadena, annual gala dinner for Asians for Miracle Marrow Matches. He truly believes in the importance of community. For more information on the special anniversary dinners and to make a reservation, call the restaurant at (626) 796-9501 or visit the website at www.maisonakira.net.